Basement Finishing and Remodeling Contractor in Yardley, Newtown, New Hope, Langhorne, Washington Crossing, Richboro area. Lacking space in your own house? The solution might be right under your feet. Design-Built Bucks County basement finishing and remodeling contractor. Does your Bucks County, Yardley, New Hope, Newtown, or Richboro home need a basement finished? 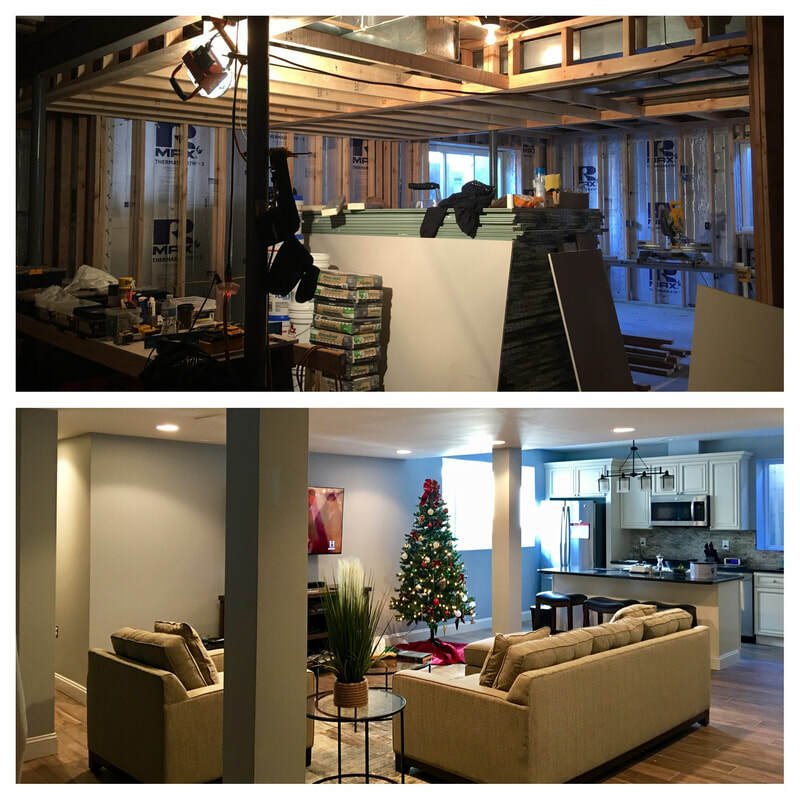 No matter what is the renovation purpose, ensuring that new space is comfortable, warm, dry and healthy is a critical part of every basement finishing project we, at the All in One Renovations, take on. Helmed by a team of professional contractors in basement finishing and other home improvement matters and equipped with the right tools, we deliver quality results which are beyond the expectations of our clients. Things to consider before finishing your basement. It makes no sense to spend your effort and money installing beautiful new rooms in an unsound structure. 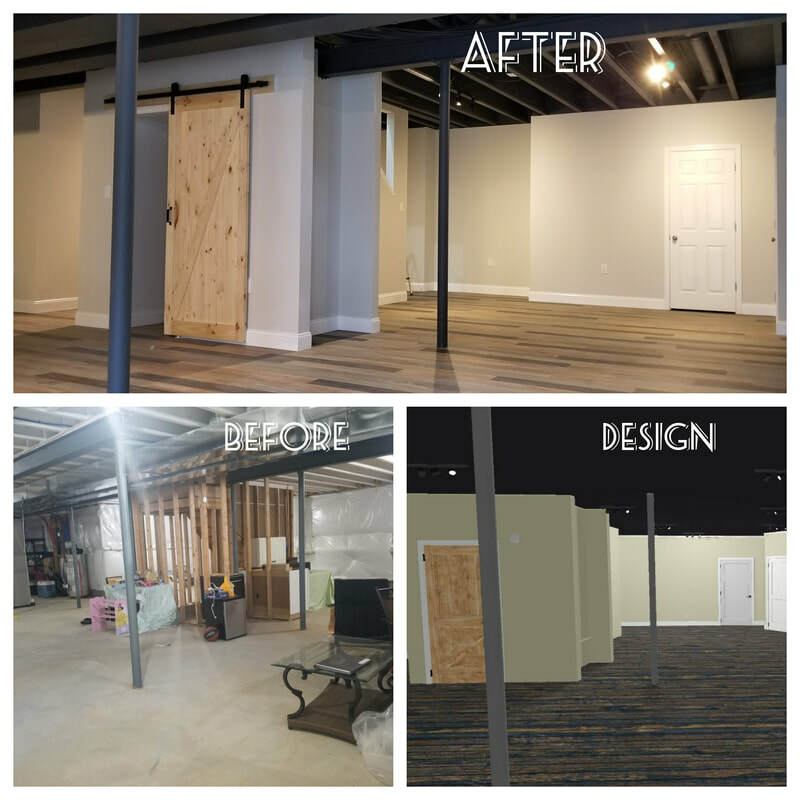 Before undertaking the basement renovation project in Yardley, New Hope, Newtown, Richboro, and other places in PA, our Bucks County basement finishing contractors will help you identify few important things to take into consideration. Moisture problem. Water leaking. Dampness. After we make sure that existing conditions of your basement satisfy all the safety and proper code requirements, we’ll be able to provide you with the estimate and a working plan of your basement renovation ideas. At our initial on-site consultation we will inspect your basement’s current conditions. It’s a deciding element of every basement remodeling project that many contractors are neglecting. We also will be discussing choice of material and finishes that you'd like to see in a finished basement. That will help us to prepare proper estimate and a job scope. After that permits have to be obtained and the job can begin. Typical basement fishing job scope will include are: framing, electrical, plumbing, insulation, drywall, carpentry, paint, flooring, finishes. Planning to transform the unused space in your basement into a functional recreation room? If you’re living in Yardley, New Hope, Newtown, Richboro, Langhorne and other areas in PA, All in One Renovations is the professional contractor to call to for your basement finishing and other home improvement needs! Known to be a highly dependable contractor in Bucks County PA, we have the right team and equipment to execute these home improvement services in the best way possible. Throughout the years we have converted basements in different areas of Bucks county (Newtown, Yardley, Fairless Hills, Doylestown). Before you embark your basement remodeling adventure contact us for a free consultation and an estimate. Are you planning to recreate your basement and now you’re looking for quality basement finishing contractor service Yardley PA, quality basement finishing contractor service New Hope PA, quality basement finishing contractor service Newtown PA, quality basement finishing contractor service Richboro PA, quality basement finishing service Yardley PA, quality basement finishing service New Hope PA, quality basement finishing service Newtown PA, quality basement finishing service Richboro PA, quality professional basement finishing contractor service Yardley PA, quality professional basement finishing contractor service New Hope PA, quality professional basement finishing contractor service Newtown PA, quality professional basement finishing contractor service Richboro PA? All in One Renovations is the basement finishing contractor service Yardley PA, basement finishing contractor service New Hope PA, basement finishing contractor service Newtown PA, basement finishing contractor service Richboro PA, basement finishing service Yardley PA, basement finishing service New Hope PA, basement finishing service Newtown PA, basement finishing service Richboro PA, professional basement finishing contractor service Yardley PA, professional basement finishing contractor service New Hope PA, professional basement finishing contractor service Newtown PA, professional basement finishing contractor service Richboro PA to go to! Helmed by years of existence in the industry of basement finishing contractor Yardley PA, basement finishing contractor New Hope PA, basement finishing contractor Newtown PA, basement finishing contractor Richboro PA, basement finishing Yardley PA, basement finishing New Hope PA, basement finishing Newtown PA, basement finishing Richboro PA, professional basement finishing contractor Yardley PA, professional basement finishing contractor New Hope PA, professional basement finishing contractor Newtown PA, professional basement finishing contractor Richboro PA, we have been trusted by many homeowners in PA for the home improvement needs. All in Renovations is a PA-based contractor providing quality basement finishing contractor service Yardley PA, quality basement finishing contractor service New Hope PA, quality basement finishing contractor service Newtown PA, quality basement finishing contractor service Richboro PA, quality basement finishing service Yardley PA, quality basement finishing service New Hope PA, quality basement finishing service Newtown PA, quality basement finishing service Richboro PA, quality professional basement finishing contractor service Yardley PA, quality professional basement finishing contractor service New Hope PA, quality professional basement finishing contractor service Newtown PA, quality professional basement finishing contractor service Richboro PA. Through our amazing basement finishing contractor service Yardley PA, basement finishing contractor service New Hope PA, basement finishing contractor service Newtown PA, basement finishing contractor service Richboro PA, basement finishing service Yardley PA, basement finishing service New Hope PA, basement finishing service Newtown PA, basement finishing service Richboro PA, professional basement finishing contractor service Yardley PA, professional basement finishing contractor service New Hope PA, professional basement finishing contractor service Newtown PA, professional basement finishing contractor service Richboro PA, we can transform your non-functional basement into a space for recreation or for other functional purposes. Your otherwise boring basement can be recreated into so many things with the help of our basement finishing contractor Yardley PA, basement finishing contractor New Hope PA, basement finishing contractor Newtown PA, basement finishing contractor Richboro PA, basement finishing Yardley PA, basement finishing New Hope PA, basement finishing Newtown PA, basement finishing Richboro PA, professional basement finishing contractor Yardley PA, professional basement finishing contractor New Hope PA, professional basement finishing contractor Newtown PA, professional basement finishing contractor Richboro PA.
At All in One Renovations, rest assured that each and every quality basement finishing contractor service Yardley PA, quality basement finishing contractor service New Hope PA, quality basement finishing contractor service Newtown PA, quality basement finishing contractor service Richboro PA, quality basement finishing service Yardley PA, quality basement finishing service New Hope PA, quality basement finishing service Newtown PA, quality basement finishing service Richboro PA, quality professional basement finishing contractor service Yardley PA, quality professional basement finishing contractor service New Hope PA, quality professional basement finishing contractor service Newtown PA, quality professional basement finishing contractor service Richboro PA that we provide are afforded with utmost commitment to professionalism and efficiency. We are composed of professionals in basement finishing contractor service Yardley PA, basement finishing contractor service New Hope PA, basement finishing contractor service Newtown PA, basement finishing contractor service Richboro PA, basement finishing service Yardley PA, basement finishing service New Hope PA, basement finishing service Newtown PA, basement finishing service Richboro PA, professional basement finishing contractor service Yardley PA, professional basement finishing contractor service New Hope PA, professional basement finishing contractor service Newtown PA, professional basement finishing contractor service Richboro PA and equipped with the latest tools to execute our services in no time. As such, we have been deemed as PA’s one of the best basement finishing contractor Yardley PA, basement finishing contractor New Hope PA, basement finishing contractor Newtown PA, basement finishing contractor Richboro PA, basement finishing Yardley PA, basement finishing New Hope PA, basement finishing Newtown PA, basement finishing Richboro PA, professional basement finishing contractor Yardley PA, professional basement finishing contractor New Hope PA, professional basement finishing contractor Newtown PA, professional basement finishing contractor Richboro PA. When you notice cracked foundation, damaged or sagging joints, or water leaking in your basement, it’s definitely high time to call your trusted basement finishing contractor Yardley PA, basement finishing contractor New Hope PA, basement finishing contractor Newtown PA, basement finishing contractor Richboro PA, basement finishing Yardley PA, basement finishing New Hope PA, basement finishing Newtown PA, basement finishing Richboro PA, professional basement finishing contractor Yardley PA, professional basement finishing contractor New Hope PA, professional basement finishing contractor Newtown PA, professional basement finishing contractor Richboro PA. All in One Renovations is just a phone call away from addressing these basement-related problems. Our basement finishing contractor service Yardley PA, basement finishing contractor service New Hope PA, basement finishing contractor service Newtown PA, basement finishing contractor service Richboro PA, basement finishing service Yardley PA, basement finishing service New Hope PA, basement finishing service Newtown PA, basement finishing service Richboro PA, professional basement finishing contractor service Yardley PA, professional basement finishing contractor service New Hope PA, professional basement finishing contractor service Newtown PA, professional basement finishing contractor service Richboro PA include assessing the condition of your basement, initial on-site consultation, submitting proposal, and once the proposal is agreed upon, executing the right type of service. With our basement finishing contractor Yardley PA, basement finishing contractor New Hope PA, basement finishing contractor Newtown PA, basement finishing contractor Richboro PA, basement finishing Yardley PA, basement finishing New Hope PA, basement finishing Newtown PA, basement finishing Richboro PA, professional basement finishing contractor Yardley PA, professional basement finishing contractor New Hope PA, professional basement finishing contractor Newtown PA, professional basement finishing contractor Richboro PA, everything will be well taken care of. Rest assured that our basement finishing contractor service Yardley PA, basement finishing contractor service New Hope PA, basement finishing contractor service Newtown PA, basement finishing contractor service Richboro PA, basement finishing service Yardley PA, basement finishing service New Hope PA, basement finishing service Newtown PA, basement finishing service Richboro PA, professional basement finishing contractor service Yardley PA, professional basement finishing contractor service New Hope PA, professional basement finishing contractor service Newtown PA, professional basement finishing contractor service Richboro PA can deliver results. Your unused basement can now be transformed into a functional space with one of PA’s trusted basement finishing contractor Yardley PA, basement finishing contractor New Hope PA, basement finishing contractor Newtown PA, basement finishing contractor Richboro PA, basement finishing Yardley PA, basement finishing New Hope PA, basement finishing Newtown PA, basement finishing Richboro PA, professional basement finishing contractor Yardley PA, professional basement finishing contractor New Hope PA, professional basement finishing contractor Newtown PA, professional basement finishing contractor Richboro PA, the All in One Renovations! Quality workmanship and professional work ethics made us one of the established basement finishing contractor Yardley PA, basement finishing contractor New Hope PA, basement finishing contractor Newtown PA, basement finishing contractor Richboro PA, basement finishing Yardley PA, basement finishing New Hope PA, basement finishing Newtown PA, basement finishing Richboro PA, professional basement finishing contractor Yardley PA, professional basement finishing contractor New Hope PA, professional basement finishing contractor Newtown PA, professional basement finishing contractor Richboro PA. No unnecessary fuss when you work with our amazing team of basement finishing contractor Yardley PA, basement finishing contractor New Hope PA, basement finishing contractor Newtown PA, basement finishing contractor Richboro PA, basement finishing Yardley PA, basement finishing New Hope PA, basement finishing Newtown PA, basement finishing Richboro PA, professional basement finishing contractor Yardley PA, professional basement finishing contractor New Hope PA, professional basement finishing contractor Newtown PA, professional basement finishing contractor Richboro PA! Call us now to experience the professionalism that we boast as one of the leading basement finishing contractor Yardley PA, basement finishing contractor New Hope PA, basement finishing contractor Newtown PA, basement finishing contractor Richboro PA, basement finishing Yardley PA, basement finishing New Hope PA, basement finishing Newtown PA, basement finishing Richboro PA, professional basement finishing contractor Yardley PA, professional basement finishing contractor New Hope PA, professional basement finishing contractor Newtown PA, professional basement finishing contractor Richboro PA! Aside from being basement finishing contractor Yardley PA, basement finishing contractor New Hope PA, basement finishing contractor Newtown PA, basement finishing contractor Richboro PA, basement finishing Yardley PA, basement finishing New Hope PA, basement finishing Newtown PA, basement finishing Richboro PA, professional basement finishing contractor Yardley PA, professional basement finishing contractor New Hope PA, professional basement finishing contractor Newtown PA, professional basement finishing contractor Richboro PA, we’re also a kitchen and bathroom remodeling contractor.